Here is my annual post of updating this list of the Brooklyn Dodgers players alive. From the Brooklyn Dodger players, we lost Andy Pafko, Don Lund, Preston Ward and the youngest one, Don Miller. 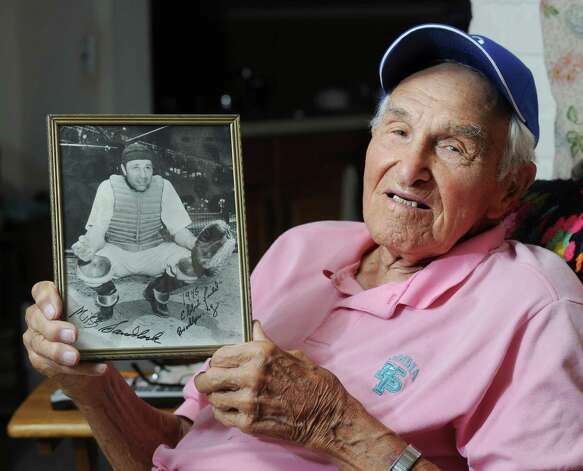 We now have 38 surviving Broklyn Dodger players with Mike Sandlock who continues to be the oldest one. Mr. Sandlock will turn 99 on October 17. The youngest one is now Bob Aspromonte who will turn 75 on June 19. Happy birthday to Ralph Branca who turns 88 today January 6, Dia de Los Reyes, Day of the Kings. I wish you all a healthy 2014. This year I decided to do a post for each of the Brooklyn Dodger players that are alive giving us a little history of their playing day and If possible, where they are now. This is going to be fun and is a way for me to learn more about the Brooklyn Dodger players and at the same time pay tribute to them. We will start with Mike Sandlock who is the oldest one at 97. When I look at the uniform numbers Mr. Sandlock wore, I think of the retired numbers of #1, Pee Wee Reese & #4, Duke Snider. Mike Sandlock professional career began back in 1938 for the Huntington Bees of the Mountain State League. He spent 14 years in the minors and played parts of five seasons in the majors. Mike made his major league debut as a September call-up for the Braves in 1942. He came in late in the game and collected his first big league hit, a single off of Giants reliever Bill McGee. Mike’s roommate in the Minors, Warren Spahn, was also called up that September. In 1943 Mike missed the entire season due to his services in WW II. On August 12, 1944, the Braves traded him to the Brooklyn Dodgers in exchange for minor league second baseman Frank Drews. Sandlock went back to the minors with their Triple-A affiliate in ST. Paul where he batted over .300 and added switch hitting to his offensive repertoire. Sandlock, a catcher, was a shortstop early in the season, Pee Wee Reese was still in the Navy. When Mickey Owen joined the service in May, the Dodgers were forced to use their backup catchers, but it wasn’t until July that they moved Sandlock back behind the plate and gave him regular playing time. That 1945 season would end up being his best season in the majors. He played a career high 80 games, hitting .282 with 17 RBI’s in 195 at-bats. 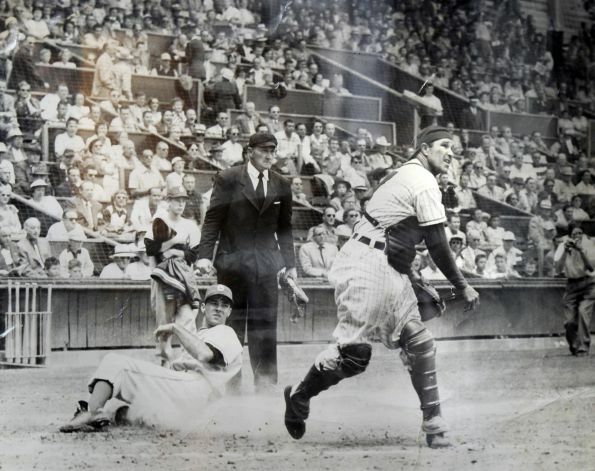 In 1947 Mike was the backup catcher for a young Roy Campanella, while playing for the Montreal Royals. He also met Jackie Robinson. They both shared a love for Golf. With his time in Brooklyn done, Mike embarked on a career in the minor leagues that brought him to Hollywood for four years and many great memories. Mike Sandlock joined the Hollywood Stars of the Pacific Coast League in 1949, spending four seasons with the team before his return trip to the Majors with the Pirates. Mike playing for the Hollywood Stars. Two people were very influential in getting Mike back to the Majors: The team manager, Fred Haney and knuckelball pitcher Johnny Lindell. Mike developed a reputation for being an excellent receiver of knuckleball pitchers. When Johnny moved to the Majors so did Mike. The Pirates had 3 to 4 pitchers who threw knuckleballs. Mike shared catching duties with Joe Garagiola and Heisman Trophy Winner Vic Janowicz. Late in the season the Pirates sold Lindell to the Phillies. the following year Sandlock was a Phillie but it was not to be for Mike as he was involved in a home plate collision during a Spring Training game. Phillies shipped him to San Diego. That 1954 was his final year of his baseball career. Sandlock feels the modern game moves too slowly compared to when he played. He feels too much time is spent today with pitchers walking around the mound, the catcher going to the mound then the entire infield going to the mound and guys constantly adjusting their batting gloves and stepping out of the batter’s box. He attended a Yankee game recently when Freddy Garcia was on the mound and said he could not wait to leave because of how long Garcia took to deliver each pitch. Mike Sandlock with Don Mattingly at Citi Field. Mr. Sandlock still lives in the place where he was born. As of last year, Mike was still playing Golf once a week . We lost two Brooklyn Dodgers in 2012 so we have 42 Brooklyn Dodgers alive as of 2013. How Sweeeet it is! Dodgers Sweeep the Mets. Happy Day! Dodgers Sweep the Mets! Dodgers have a four game winning streak and have scored 28 runs in those four games. The Giants lost in 12 innings. Josh Wall made his MLB debut and got the win Sunday. Dodgers nuns with Andre & Kemp. El Cochito Luis Cruz hit his first Major League homerun. The Boys in Blue are now in St Luis to play four games there. Chad Billingsley goes off the DL to start Monday against local boy from Southern California, Joe Kelly.